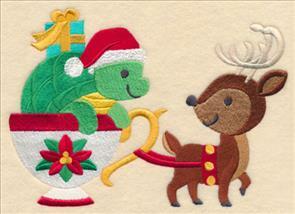 Stitch the very best that Christmas has to offer with new holly jolly holiday designs! 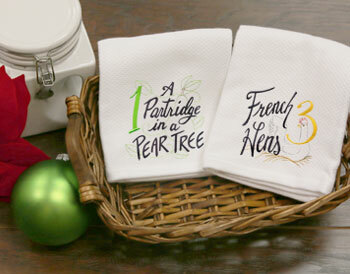 Tree skirts, pillows, dish towels, and more have never looked this festive before! 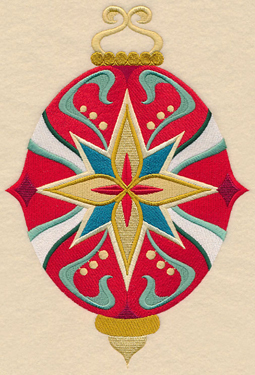 New ornaments from around the world stun on quilts and stockings, while 12 Days of Christmas designs are a contemporary addition to any project. 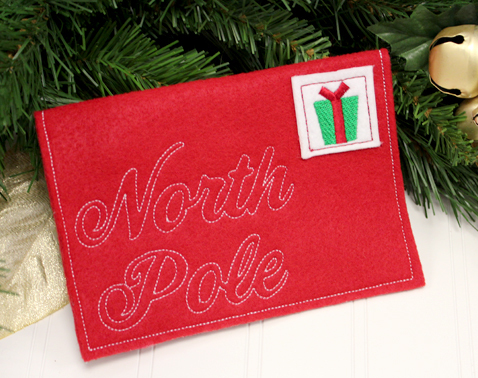 Whip up a stocking stuffer for your mantel, or slip a letter to Santa inside an in-the-hoop envelope. Order today these festive designs today! 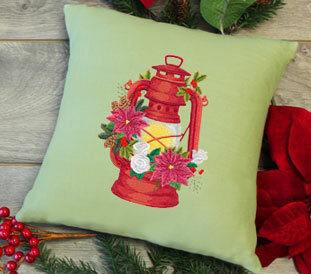 A holiday pillow gets a striking update when embroidered with this lantern design. 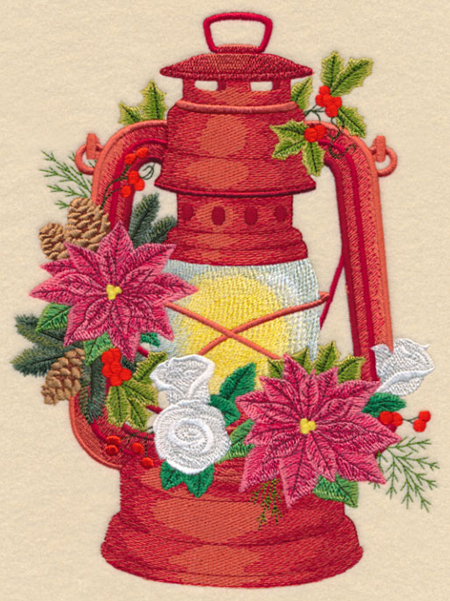 Gorgeous poinsettias, roses, and other festive foliage surround this Christmas lantern with the natural beauty of the holiday season. 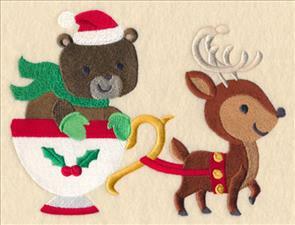 Stitch the spectacular design on pillows, wall hangings, and quilts for a breathtaking addition to any Christmas decor. 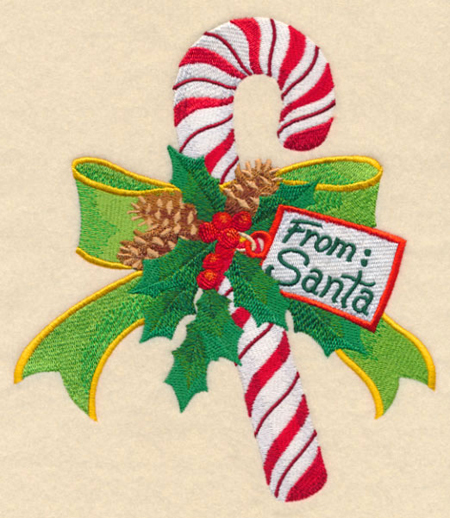 6.90" x 9.15" and 5.85" x 7.76" and 4.85" x 6.43"
Stitch the sweetness of the season on aprons, placemats, and cookie bags with this lovely candy cane design. With a tag that reads "From Santa" and an arrangement of pinecones and holly, it's a fabulous addition to any project. 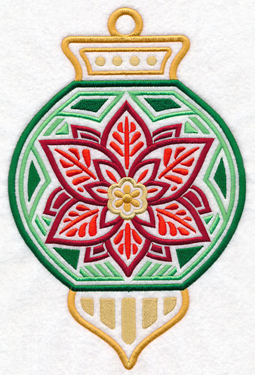 6.89" x 7.82" and 5.86" x 6.65" and 4.83" x 5.48"
Embroider beautiful ornaments from all over the world! 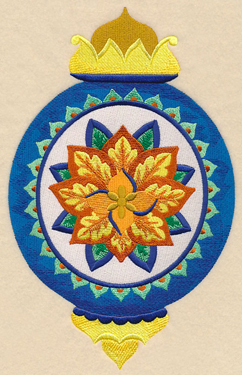 Featuring fabulous artwork like Delft blue from the Netherlands or Suzani from Uzbekistan, these tree decorations are festive additions to any project. 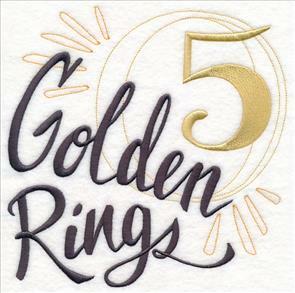 6.89" x 8.12" and 6.20" x 7.30"
5.56" x 6.55" and 4.84" x 5.70"
6.88" x 10.06" and 5.86" x 8.56"
5.22" x 7.62" and 4.66" x 6.80"
A gorgeous ornament featuring classic French art nouveau gives the design on the left jaw-dropping glamour. 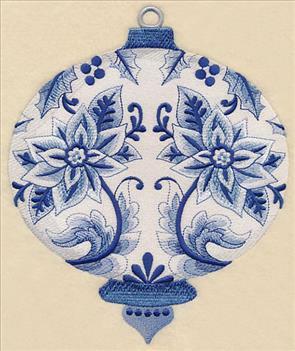 An ornament showcasing Italy's Majolica style can be found on the right. 6.86" x 10.05" and 5.86" x 8.56"
5.33" x 7.78" and 4.66" x 6.82"
6.90" x 10.89" and 5.87" x 9.27"
4.93" x 7.77" and 4.34" x 6.84"
These global designs are perfect for adding to pillows, wall hangings, tree skirts, and more! 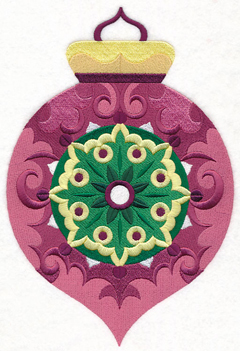 Here Norwegian Rosemaling and Mola from Panama are represented in these designs. 6.88" x 10.28" and 5.83" x 8.71"
5.16" x 7.71" and 4.57" x 6.82"
6.91" x 10.42" and 5.86" x 8.84"
5.18" x 7.81" and 4.55" x 6.86"
Travel around the world this holiday season with these beautiful ornament designs. Get them all now in a design pack. 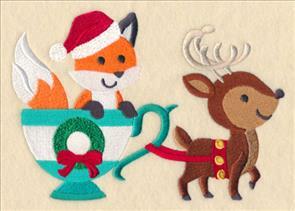 Adorable animals in teacups are terrific for adding to Christmas projects for all ages! 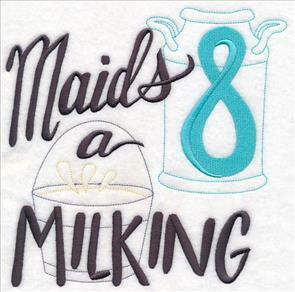 Stitch on aprons for the kitchen or a pair of pajamas for kids to wear on December 24. 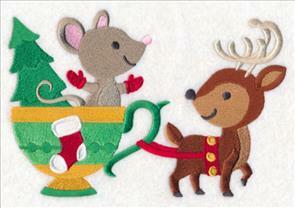 7.80" x 5.67" and 6.64" x 4.82" and 3.85" x 2.80"
Each design features a friendly critter being pulled in a teacup sleigh by a reindeer. 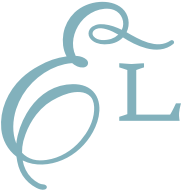 Different accents (think scarves, holiday gifts, Santa hats, and more) give each design a distinct style. 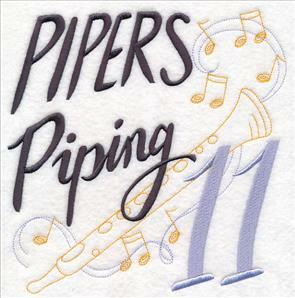 7.77" x 5.24" and 6.84" x 4.60" and 3.85" x 2.60"
Use all six designs together, or stitch your favorite alone. They're whimsical additions to quilts, kids' gear, kitchen projects, and more. 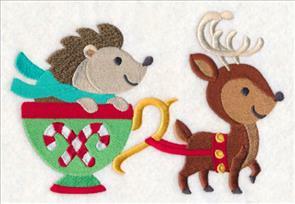 7.80" x 5.57" and 6.78" x 4.84" and 3.85" x 2.76"
Add one of these too-cute cup o' Christmas critters to your next project. Get them all now in a design pack. 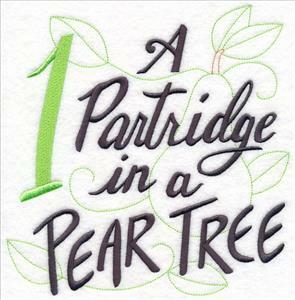 On the first day of Christmas, my true love gave to me...12 days of Christmas embroidery designs! 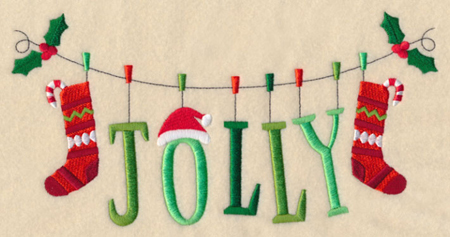 Stitch the lyrics to the ever-popular Christmas carol with these contemporary motifs. 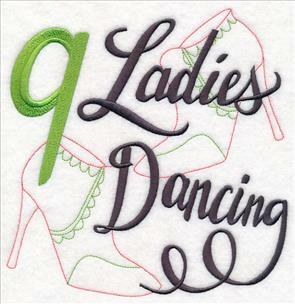 These designs are chic on their own, but stitch the whole group for even more style. 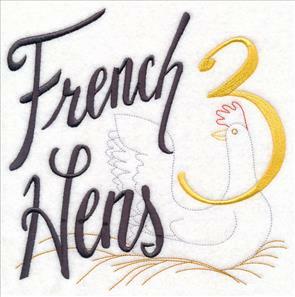 They're the perfect number of designs for embroidering on a set of dish towels, quilt blocks, or framed art -- great for decorating for the holidays! 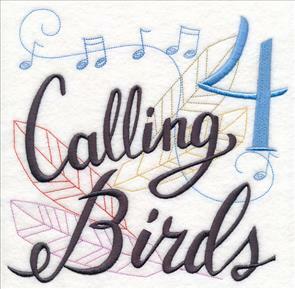 Each of the designs features the gift and corresponding number in bold text with a light-stitching illustration in the background. Great for tea towels, blankets, and more. 7.81" x 7.79" and 6.87" x 6.86"
Adapt the colors of the designs to fit a decorating scheme, project theme, or to match your favorite hues. 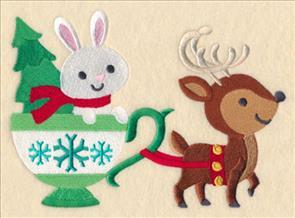 The fun and festive designs are a great way to share your holiday spirit. 7.77" x 7.80" and 6.85" x 6.85"
5.86" x 5.85" and 4.86" x 4.86"
5.85" x 5.88" and 4.85" x 4.88"
Family, friends, and holiday guests won't be able to resist breaking out into song when they see your project featuring these designs. 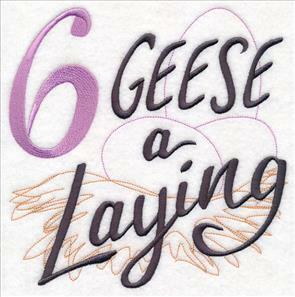 Add to a wall hanging for the living room, or a blanket for the guest bed. 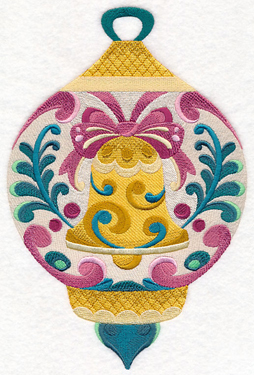 7.79" x 7.79" and 6.84" x 6.85"
The light-stitching background of these designs make them a flash to stitch out. 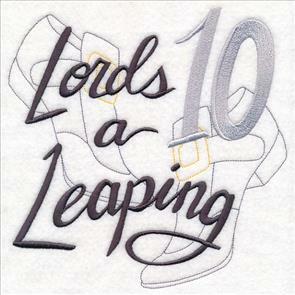 Use solid-color, low-nap fabrics for best results. 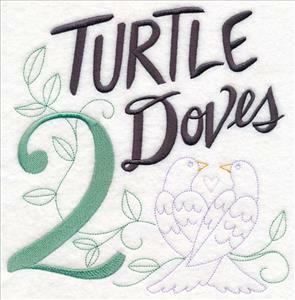 5.88" x 5.85" and 4.86" x 4.83"
Whether you stitch all twelve or highlight your favorite part of the song, these festive designs are an eye-catching addition to any project. 5.86" x 5.86" and 4.85" x 4.86"
Celebrate Christmas in style with a project adorned with these ho-ho-holiday designs. Get them all now in a design pack. 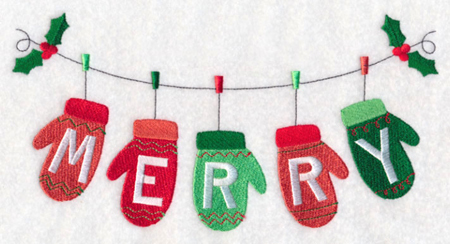 Sweatshirts, tote bags, and aprons will get a holly jolly (or very merry!) 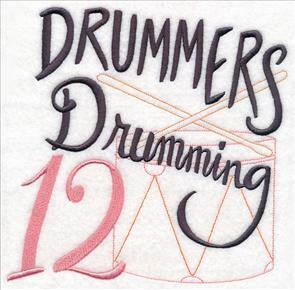 update thanks to clothesline designs. The classic holiday colors and details give them a fa-la-la-fabulous look. 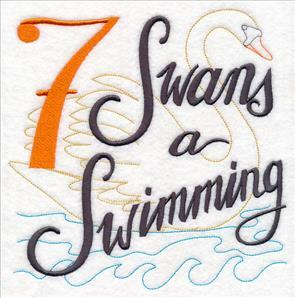 9.40" x 4.71" and 7.80" x 3.91" and 6.85" x 3.43"
Embroider the two clotheslines together on either side of a tote bag, or on a pair of coordinating sweatshirts. 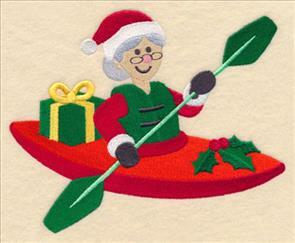 A fun way to stitch for the season! 9.40" x 4.80" and 7.80" x 3.98" and 6.84" x 3.49"
candy, or small presents inside the pocket on the front for an extra-special holiday treat. 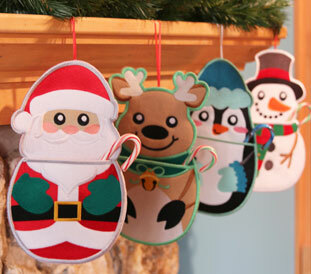 See how to stitch and assemble the stockings in this project tutorial. 6.78" x 11.73" and 5.42" x 9.38"
4.50" x 7.77" and 3.96" x 6.83"
6.87" x 11.60" and 5.59" x 9.43"
6.71" x 11.65" and 5.44" x 9.40"
4.53" x 7.81" and 3.98" x 6.85"
your holiday spirit. Perfect for giving to friends or family! See the project instructions for this envelope right here. 7.82" x 9.06" and 6.76" x 7.78" and 4.88" x 5.62" and 3.90" x 3.86"
Jacquie loves to kayak, and was hoping we could add some designs featuring the water sport to the website. 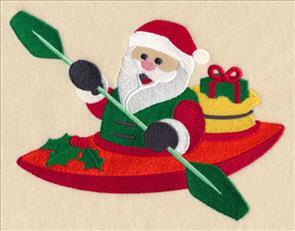 Here, Santa and Mrs. Claus add a fun holiday twist to the theme. Thanks for the suggestion, Jacquie! 7.73" x 5.85" and 6.41" x 4.85" and 3.88" x 2.95"